we have been literally inundated — we get calls all the time from friends in istanbul who have heard about the floods in our area. being on a slope, we do not so much have floods as streams; everywhere you look, practically, there are rivulets of water purposefully making their way downwards. thus, not much sun has graced our skies. the fridge runs on gas, we only use one electric kitchen appliance (a hand blender) and we are used to not charging anything like phones or the computer when the sun isn’t out, so we don’t really notice any change until we’ve had enough sunless days to be without lights at night. 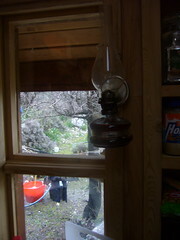 last night, we got there, and down came the trusty old kerosene lamp, still hanging on its spot by the window where it used to burn every night before we hooked up our solar panels. being in lamplight at night is relaxing. it feels more private than the saturation of the electric bulb, and after dinner, baki, ali and i went about our business cloaked in our own shadows. as we did before we had lights at all, we turned in early, and as a result we were up with the sun, checking on the chickens, tidying up, building with blocks, and so on. it was a nice throwback to the “good old days” after having gotten used to having lights for so long.